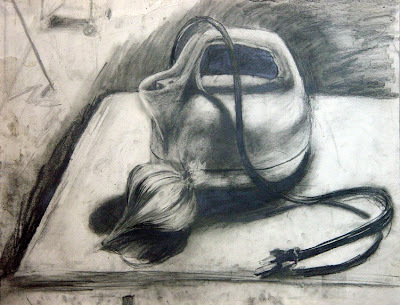 Provide a group of objects (still-life) and a light for black and white and coloured drawing assignments for in class assignments or for home work. This selection should not be made at last minute and should have serious contemplations as to which type of object you choose to use. Certain objects will work best in certain contexts and others may not. 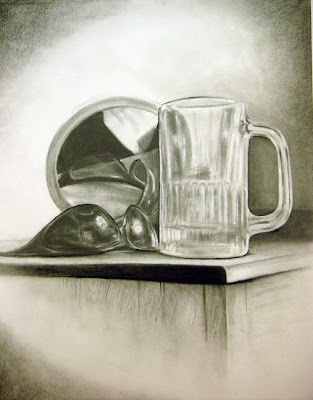 The choice of object and level of seriousness in choosing an object will influence the success and ultimately the evaluation (grade) of any given assignment. 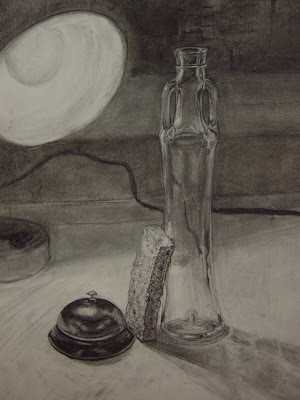 When using black and white mediums (pencils, graphite, conte, pastel, oil pastel, charcoal, ink and paint) white or off white objects will be required as subject matter for observational drawing assignments. At times there will be requirements to bring an object or a group of objects that will be textured, reflective, and or transparent. 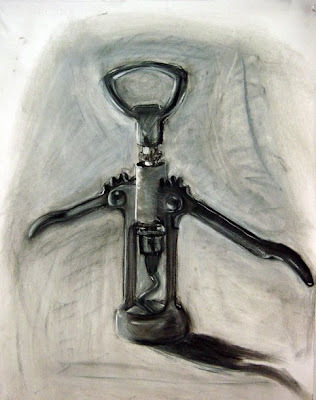 For black and white drawings at times students will require a small clip-on light and extension cords, which will also aid students in their assignments. 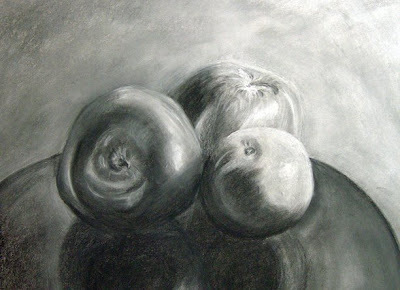 For black and white drawings use the selected light source to experiment with different lighting settings that will allow for a good range of light and dark tones in the drawing. 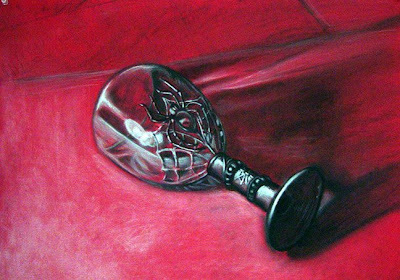 As well the light will create interesting shadows and generally will create an interesting context for the object to be drawn in. 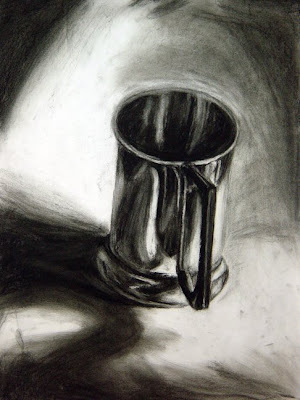 As well when considering a prospective object look for interesting shapes to draw that will allow for some light and shadow variations on its surface. The above drawing of garlic clover is an excellent example of an off white object(s) to draw. 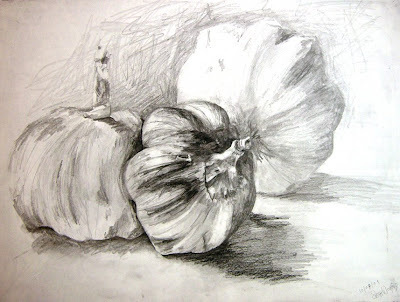 This garlic drawing is unfinished but demonstrates some of the key ideas for drawing objects with light and shadow. 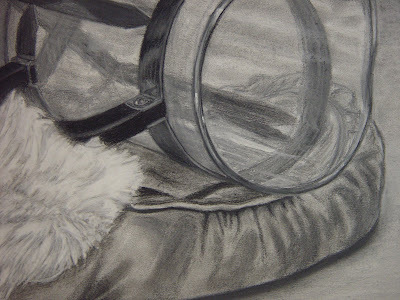 The drawing demonstrates a strategic use of detail and high contrast in the foreground. As well the drawing progressively decreases in detail and contrast as the viewer reaches the background (the clover that is farthest form in the picture) As well the edges in the foreground are sharper and the edges of the clovers in the background are progressively dissolving into the background space (or into the negative space). The process of the above garlic drawing is also excellent. 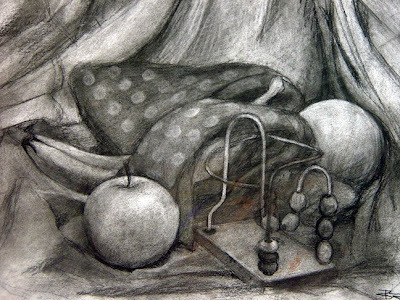 This process entailed drawing lightly and tentatively over the entire paper and then in the mid to later stages detail and daker tones were layered onto the drawing. The above drawing of a white porcelain object is also a good example of a white or an off-white object. 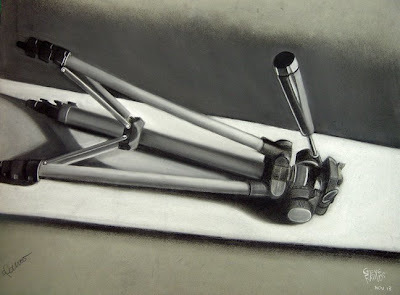 With the exception of a vaguely drawn table plane in the foreground area the execution of the drawing fulfills the objectives of the assignment. The entire page is filled with various tones and a strong sense of mass (the objects forms) are depicted an atmosphere. Some parts of the above object appear to almost pop out from the page of the paper. 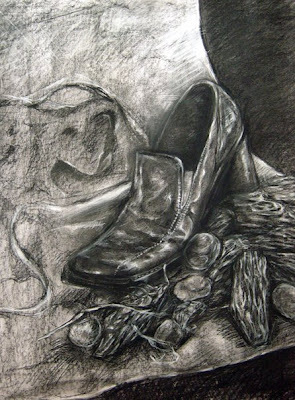 This drawing as well demonstrates a strategic use of detail and high contrast in the foreground. As well the drawing progressively decreases in detail and in contrast as the viewer reaches the background and furthest edges of the object. 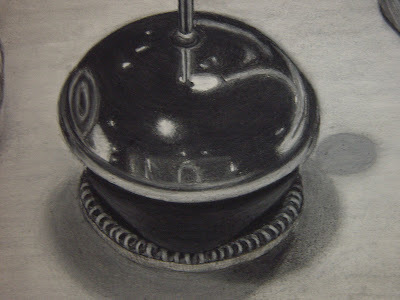 As well the edges in the foreground (center of the object) are sharper and the outer edges of the object progressively dissolving into the background space. Overall this work is an excellent example of strategically depicting soft and sharp edges in relation to space. 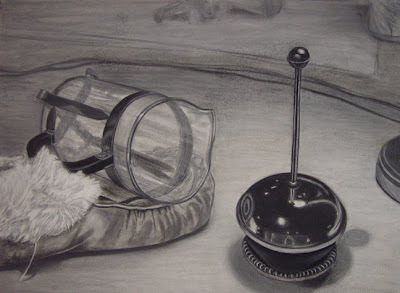 The above white object is a very challenging object due to numerous small details. 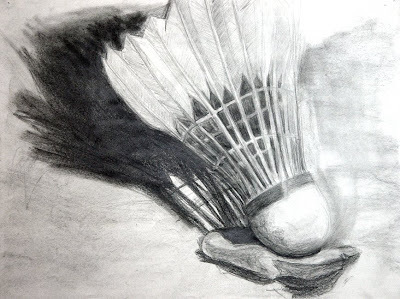 A person with experience and extra patience will be required to successfully draw and to strategically describe light and shadow on the small details of the object's plastic feathers. Despite the ambitious choice of an object this work is slightly unfinished, spatially confused, elliptical shapes are distorted, and some areas of the object appear flat but overall it is a good drawing. 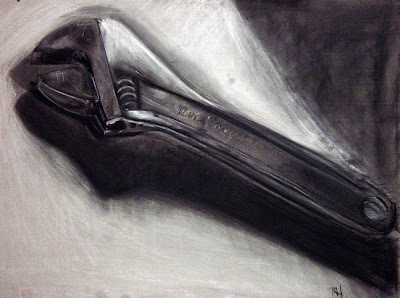 Like in the Negative Space Drawing students are required to mix a black (or a neutral colour which will be close to black) using either Raw Umber with Pthalo Blue OR Alizarin Crimson Red with Pthalo Green. 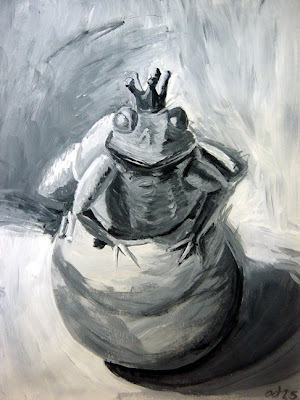 Like in the previous rendered assignments the objectives for rendered drawing assignments will be required with the addition of mixing the grayscale or monochromatic range (using white with the mixed black) and considering the range of mark making with various brush sizes. 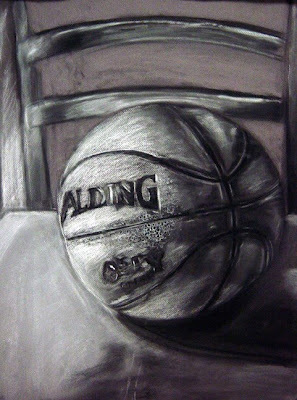 Another good example of a white object but completed with acrylic paint. 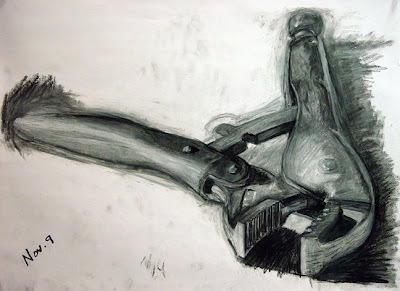 The strategy of this work follows much of the strategy used in the above drawings. 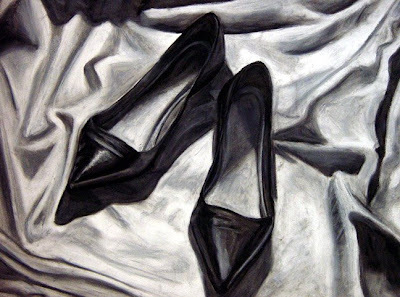 The above example presents an exceptional depiction of a textured object using paint. Part of the success of this drawing was due to the intense layering of paint and editing with the paint. 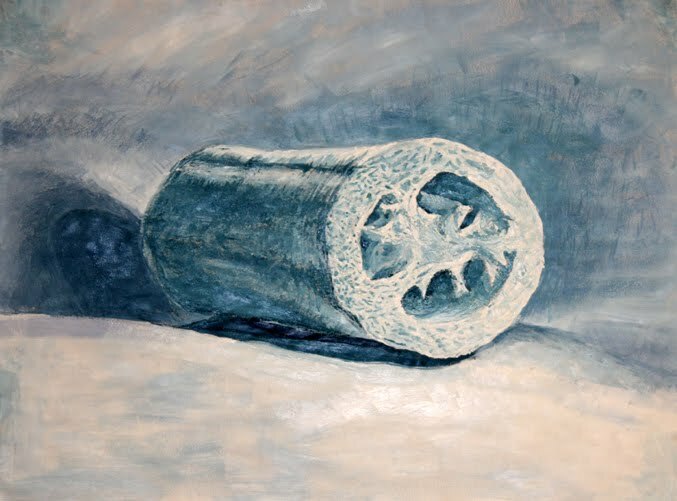 This work demonstrates a combination of the paint being used in a thick and opaque ways with multiple transparent layers (glazing technique) where layered washes of paint are applied often with several layers. In some select areas glazing was used on thick areas of paint (once the the thick areas were dry) to either decrease or increase contrast. As well this work represents an overall excellent example of strategic use with detail, contrast and sharp to soft edges. Another white object depicted with acrylic paint. 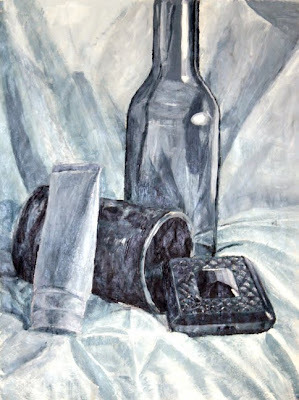 The process of this painting was done with a glazing technique that is similarly used in watercolour. 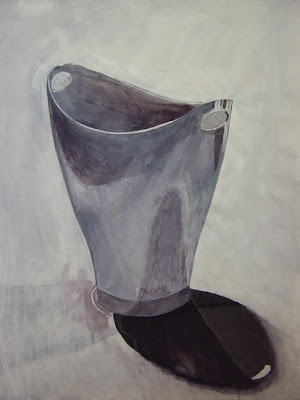 The acrylic paint is watered down and multiple layers of translucent tints are used as part of the technique to build up the 3 dimensional illusion in the work. Note: this work did not use black- instead alizarin crimson (red) and pthalo green were used to create black. 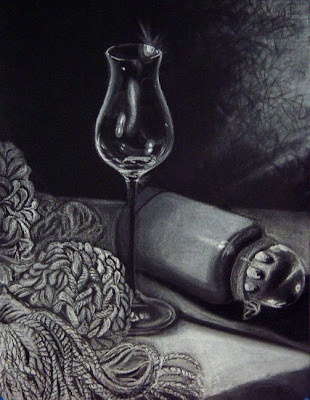 An ambitious example of a textured, reflective and transparent objects used in a painted still life. Spatially the depiction of the objects are slightly confused and perhaps more strategic use of detail, contrast and sharp to soft edges should have been considered but in combination overall a very good and ambitious painting of textured, reflective and transparent surfaces. The above white object's success is derived from the strategic use of soft and hard edges, articulation of detail (or lack of detail) and different levels of high and low contrast. 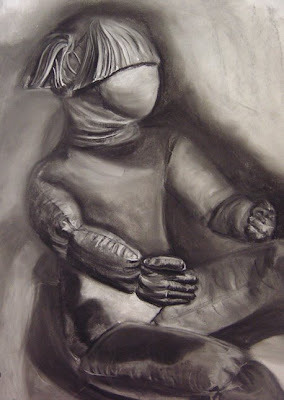 The doll's limbs on its left side are drawn with a very different approach (drawing style) than the limbs on the right side. The drawing above demonstrates a depiction of value. Colour has been translated into grayscale. The drawing above and the two drawings below make use of black, coloured, or a tinted paper. 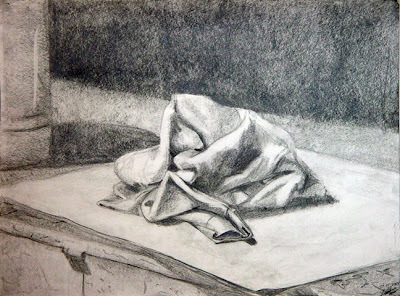 In this example of work above the chosen object of an arranged cloth was clearly chosen at last minute and appears to be drawn slightly flat and the spatial relationships within the cloth are slightly confused. As well some line could have been absorbed more into the rendered shadow areas. 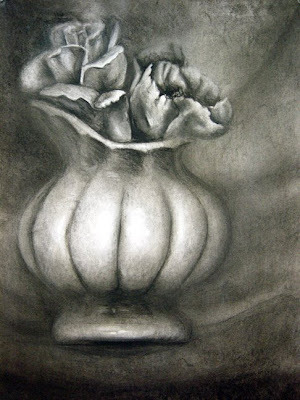 However the composition is excellent due to various subject matter in the back ground and foreground and the way forms are interacting with the border edges of the drawing. As well there is an excellent use of atmospheric perspective created by the strategic use of various soft and sharp edges progressing from the background to foreground. As well the strategic use in different levels of detail, and different levels of contrast also assist in the overall success of this drawing's and its illusion of volumes in space.